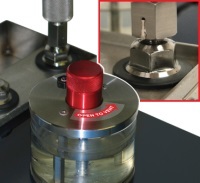 In response to continued customer demand for higher pressure products, we are proud to announce the new GaugeCalHP pressure comparator for test & calibration up to 15 000 psi. 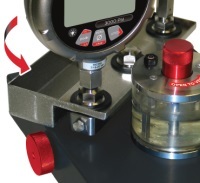 The GaugeCalHP is designed and manufactured by Crystal Engineering and includes CPF fittings, a reservoir relief valve, and high design safety factors making it the safest comparator available. It’s also versatile enough to use with water or oil, inside a lab or out in the field, and with most large size pressure gauges. Once your customers try it, they’ll never want to use another piece of equipment to calibrate with. Generates 15 000 psi – With 37% less torque required. Fine Adjust – Easy to use, even at 15 000 psi. Connection Fitting – With easy alignment swivel capability. Pivot Manifold – Rotates for testing most large size gauges. 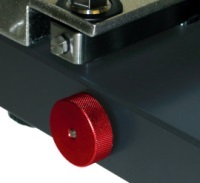 Easy to Bleed – Pressurize through the reservoir to easily bleed the air from the system to increase stability. No Mess Drip Tray – Captures fluid from bleeding the system. Reservoir – Clear, removable, reservoir with fill line. Travel Indicator – Shows the amount of stroke available. 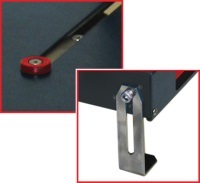 Brackets – For easy mount to a table top. Optional Carrying Case – Waterproof rolling carrying case can also be used as a table in the field. Holds your fittings and gauges too.